places the event on the timeline very accurately – up to the day! supports timespans from one year up to thousands, even millions of years. supports pre-modern dates – 1000 BC, 50 000 BC, etc. 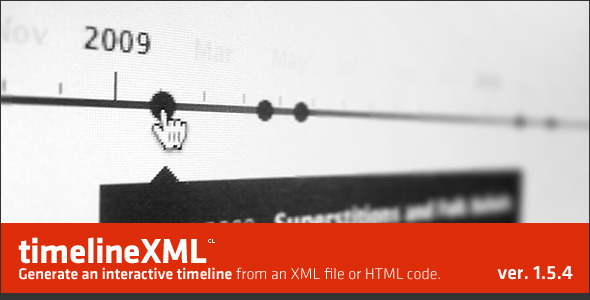 can work with any XML file – you can specify what’s the tag name for the title, for the content, etc. comes with four unique designs: basic, modern, dark and sleek. I am always looking for a way to improve my products, if you have an idea about a feature that you’d like implemented, please leave a comment! Please do not forget to rate, it helps me a lot and you will ensure the future development of this great product. Cheers! 3.94 average based on 32 ratings.